Telling people what to do doesn’t work. How do you and your team achieve results that everyone can be proud of? Your job as a boss is to get everyone moving in the same direction, keep them moving, and not bog them down. 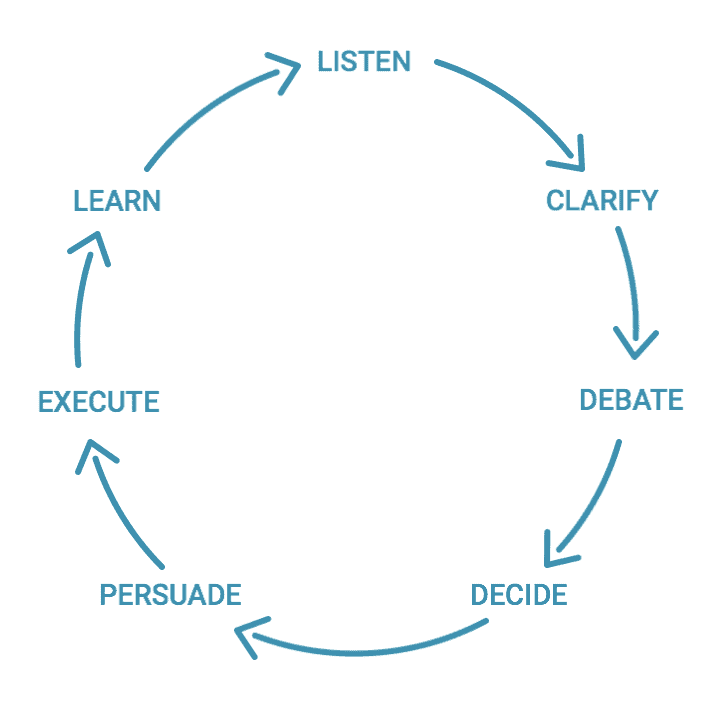 We developed a framework, the Get Stuff Done (GSD) Wheel, to help you do this. To get stuff done, you can’t just start doing stuff. Listen to your team’s ideas about the results your team should be pursuing. Help your team clarify their ideas and your understanding of the ideas so that you can help augment your team’s voice. Use debate to make ideas more beautiful, to get to the best answer. Appoint the person closest to the facts to decide. Take time to persuade the rest of the team that the decision made was a good one. Give the team time and space to execute with autonomy and purpose. After executing, learn from the new context and variables whether the decision was correct, if you executed on the right things. And start again at listen! Here some things you can do to start addressing the stages of the GSD wheel. Have regular 1:1s with each person on your team — Let them set the agenda for these meetings and use the time to listen and clarify. Hold Debate and Decide meetings — Pick the most important debates and decisions for your team each week, and include the relevant people for each. Announce decisions in All Hands meetings — use this time to persuade everyone on your team and to get them onboard with the decision. Create Meeting-Free Zones — give yourself and the people on your team time to execute. Walk Around — learn what’s happening on the ground by spending some time walking around and chatting with people on your team about the work they are doing. Learn more about achieving results in the advice columns and articles on our blog.